William Thomson, 1st Baron Kelvin OM, GCVO, PC, PRS, PRSE, (26 June 1824 – 17 December 1907) was a mathematical physicist and engineer. At the University of Glasgow he did important work in the mathematical analysis of electricity and formulation of the first and second Laws of Thermodynamics, and did much to unify the emerging discipline of physics in its modern form. He worked closely with Mathematics professor, Hugh Blackburn, at the University in his work. He also had a career as an electric telegraph engineer and inventor, which propelled him into the public eye and ensured his wealth, fame and honour. For his work on the transatlantic telegraph project he was knighted by Queen Victoria, becoming Sir William Thomson. He had extensive maritime interests and was most noted for his work on the mariner's compass, which had previously been limited in reliability. 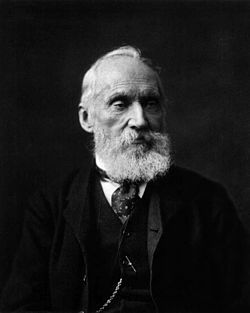 Lord Kelvin is widely known for realising that there was a lower limit to temperature, absolute zero; absolute temperatures are stated in units of kelvin in his honour. On his ennoblement in honour of his achievements in thermodynamics, and of his opposition to Irish Home Rule, he adopted the title Baron Kelvin of Largs and is therefore often described as Lord Kelvin. He was the first UK scientist to be elevated to the House of Lords. The title refers to the River Kelvin, which flows close by his laboratory at the university of Glasgow, Scotland. His home was the imposing red sandstone mansion, Netherhall, in Largs on the Firth of Clyde. Despite offers of elevated posts from several world renowned universities Lord Kelvin refused to leave Glasgow, remaining Professor of Natural Philosophy for over 50 years, until his eventual retirement from that post. The Hunterian Museum at the University of Glasgow has a permanent exhibition on the work of Lord Kelvin including many of his original papers, instruments and other artifacts. Thermodynamics By 1847, Thomson had already gained a reputation as a precocious and maverick scientist when he attended the British Association for the Advancement of Science annual meeting in Oxford. At that meeting, he heard James Prescott Joule making yet another of his, so far, ineffective attempts to discredit the caloric theory of heat and the theory of the heat engine built upon it by Sadi Carnot and Émile Clapeyron. Joule argued for the mutual convertibility of heat and mechanical work and for their mechanical equivalence. Thomson was intrigued but skeptical. Though he felt that Joule's results demanded theoretical explanation, he retreated into an even deeper commitment to the Carnot–Clapeyron school. He predicted that the melting point of ice must fall with pressure, otherwise its expansion on freezing could be exploited in a perpetuum mobile. Experimental confirmation in his laboratory did much to bolster his beliefs. In 1848, he extended the Carnot–Clapeyron theory still further through his dissatisfaction that the gas thermometer provided only an operational definition of temperature. He proposed an absolute temperature scale in which a unit of heat descending from a body A at the temperature T° of this scale, to a body B at the temperature (T−1)°, would give out the same mechanical effect [work], whatever be the number T. Such a scale would be quite independent of the physical properties of any specific substance. By employing such a "waterfall", Thomson postulated that a point would be reached at which no further heat (caloric) could be transferred, the point of absolute zero about which Guillaume Amontons had speculated in 1702. Thomson used data published by Regnault to calibrate his scale against established measurements. I believe the tendency in the material world is for motion to become diffused, and that as a whole the reverse of concentration is gradually going on — I believe that no physical action can ever restore the heat emitted from the Sun, and that this source is not inexhaustible; also that the motions of the Earth and other planets are losing vis viva which is converted into heat; and that although some vis viva may be restored for instance to the earth by heat received from the sun, or by other means, that the loss cannot be precisely compensated and I think it probable that it is under compensated. Thomson published more than 600 scientific papers and applied for 70 patents (not all were issued).